An overheating car can be a nightmare. All too many people know that feeling of that temperature gauge going up, especially when sitting at a stop light and hoping that you get moving in time for the air to cool your engine a bit. And who can discount the fear of the engine catching on fire or completely shutting down for the intense heat? There are many reasons for a car overheating, and there are just as many ways to prevent it. Here’s what you need to know about why your car is overheating. 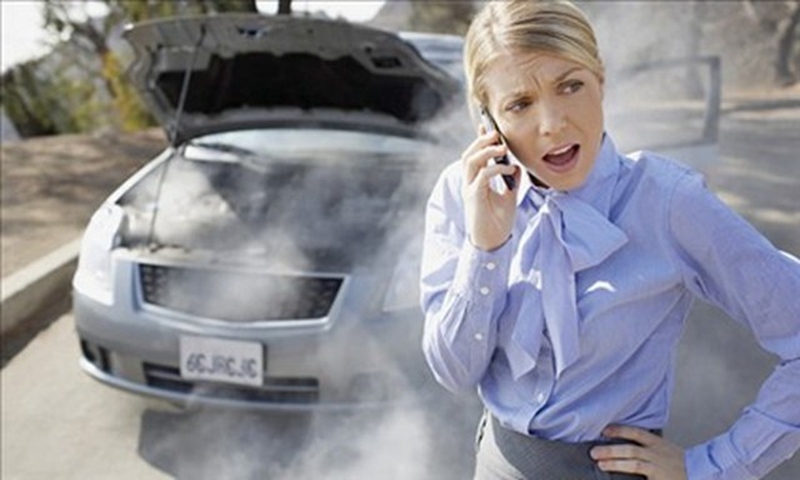 An overheating car can be caused by any number of problems. The key is to figure out which problem is causing it, and then you can solve it. In some cases, you can solve the problem on your own, without an expensive repair bill. You might get a “maintenance needed” warning light, or you might get a little symbol lighting up on the dash. Sometimes you don’t get anything at all when the coolant is very low. But when your engine overheats, this is the first thing you should check. Look at your coolant level and determine whether you need to add more. Ample coolant is vitally important for your engine, as it flows through and cools everything down, especially when you are traveling at highway speeds. The electric fan is bad. Turn on the air conditioning and see if the fan comes on. Sometimes the air conditioning will force it into action. Another way to check is to disconnect the wiring harness from your radiator fan switch (you might need to consult your manual to do this). Insert a jumper wire into both contacts and see if the fan comes on. Your fan motor might have burned out, and you could need a new one. The radiator switch is bad. When your car reaches a certain temperature, it tells the fan to switch on. But if the switch is bad, then your car never gets the message, and continues to cool the engine as if you were idling – not driving. To test the switch, go through the same actions as above. If the fan comes on when you attach the jumper wire, you need a new radiator switch. If your fan belt is broken, your car will overheat rather quickly. A broken fan belt might also mean that other parts of your engine aren’t working properly. A fan belt is more common on older cars, and the good news is that it’s very cheap and easy to fix. You can usually tell if your fan belt is broken simply by looking at the engine. When your car begins to heat up, a thermostat keeps track of the temperature. When that temperature gets to a certain point, the thermostat opens to allow more coolant to flow through, thus cooling the engine. But when it stays closed, the car seems to think it is still idling, and that means that it uses a minimal amount of coolant. The result is overheating, especially when you are driving fast on the highway. Do you have more than 50,000 miles on your car? If that’s the case, then the radiator might be filled with gunk that keeps it from operating properly. Flushing a radiator can be done every year, takes just a little bit of time, and helps ensure that your radiator never gets clogged up to the point of overheating. If you already have the problem, go to a service station to get help to flush the radiator. If you notice that your car continues to overheat no matter what you do, look underneath the car when you stop and park. If you see a great deal of liquid underneath your car, you could have a coolant leak. This can be confirmed by checking the coolant levels; if they are low even though you recently filled it up, you’ve found the problem. Go to a service station to have the problem repaired as soon as possible. If you see the temperature gauge going up, try turning the air conditioner off. Open up all the windows. This will take the pressure off the engine and give you a chance to get to help before the car dies. This might seem like a terrible idea during the summer, but the engine heat is what fuels the heater…so by turning on the heat, you are allowing the car to cool down just a little bit. If you must do this during the summer, make sure to roll down your windows! If you are in a city area, you might be able to find a service station or gas station almost immediately. But if you are traveling a long distance or out in the middle of nowhere, you might have to pull over before you get to a place where you can get help. If you must pull over, don’t open the hood until the engine stops steaming – this could take up to 30 minutes. You should always have a small bottle of coolant in the car for issues like this. If you don’t have coolant, water will do. But again, be sure not to open up any part of the engine until it is all cool to the touch. You will have to be very patient! Once you can open up the engine, check the coolant levels and pour the coolant into the proper reservoir, if necessary. Shift your car into neutral or park, then rev the engine. Do this gently! This moves some coolant through the engine and helps to keep things cooled down. You should also aim to “creep” rather than to stop and go in traffic, because you don’t want to use the brakes. Using the brakes creates friction, which then creates heat. At this point, if you can’t spot the problem and fix it right there, you will have to call a tow truck to get you to help. Fortunately, most radiator problems can be fixed quickly, but you should be prepared for the idea that your problem might take much more time to repair. When dealing with car overheating, your safety comes first. If your car is steaming or smoke is coming out from under the hood, pull over immediately and get out of your vehicle. This could mean that a fire is brewing, and that is definitely a situation you want to get away from as soon as possible. If you do open the hood, try to do so only when the car is cooled down. If you see flames or any evidence of fire, don’t even try to open it – just call 911 and back away. Never open the radiator cap while the radiator is hot, as the release of pressure could lead to serious steam and liquid burns. Even when the radiator is cooled down, be careful when you open it. Use a thick rag to protect your hand, and when you open the radiator, be sure to open the lid so that it faces away from you, just in case steam is released. Never lean over the radiator to look into it. Do not add coolant or water to the radiator when the radiator is hot. Doing so can actually crack the engine block, thanks to the abrupt temperature change – and that means a small repair just turned into a serious, expensive problem. If your coolant is entirely gone from a serious leak, don’t try to drive the vehicle. Call a tow truck instead. Driving a car without coolant means that it will lock up in just a few minutes, and that will absolutely ruin your engine. Be safe rather than sorry and call a tow truck to come help you.